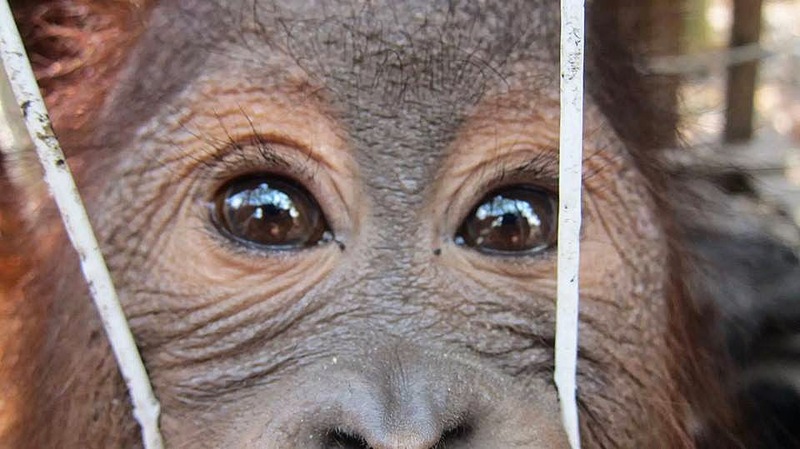 In honor of Orangutan Caring Week, we share this powerful story coming from our Partner for Wildlife: Gunung Palung Orangutan Conservation Program (GPOCP) out of Indonesia. This story chronicles the rescue of four endangered orangutans, and what will happen to them now. Rescued orangutan, Bob. Photo courtesy of International Animal Rescue. It is estimated that there are just over 50,000 Bornean orangutans left in the wild, although numbers are decreasing daily. Orangutans are the largest arboreal animals on the face of the earth today, but they are quickly losing habitat to mining and conversion of land for agriculture, namely palm oil. As habitat is lost, orangutans have nowhere to go, often ending up in the hands of local community members to be kept as pets. Remaining pockets of orangutan habitat are easily accessible from local villages and orangutans often wander into human-dominated landscapes as their forest habitat is cleared, making it easy for them to fall into the hands of community members. Rescued orangutan, Joko. Photo courtesy of International Animal Rescue. Over the past month, GPOCP has been working with the Ketapang Police Department, the Ketapang Natural Resources Conservation Authority (BKSDA), and International Animal Rescue (IAR) to successfully rescue four endangered orangutans being held as pets, which is illegal under Indonesian law. 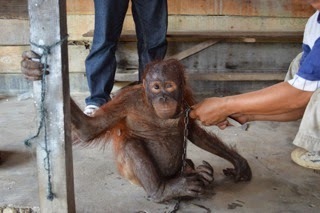 The hope is that these orangutans will be rehabilitated and able to be released back into the wild. Based on information gathered by GPOCP investigators, it was discovered that four orangutans were being held as pets in different counties in the Ketapang district of West Kalimantan, Indonesia. GPOCP investigators initially gathered and reported the evidence, which was followed up on by the Ketapang Police Department and BKSDA, who then coordinated the rescue operations with IAR. All four orangutans were taken to IAR’s Orangutan Rehabilitation Facility in Ketapang, where they will live until they have regained the skills necessary to return to their forest habitat. Photos courtesy of International Animal Rescue. The rescue of the male orangutan in Manis Mata is an especially significant accomplishment, as GPOCP initially reported this case to BKSDA over a year ago. BKSDA is the legal conservation authority in Indonesia, so neither GPOCP nor IAR are allowed to rescue or confiscate any animals without their presence. 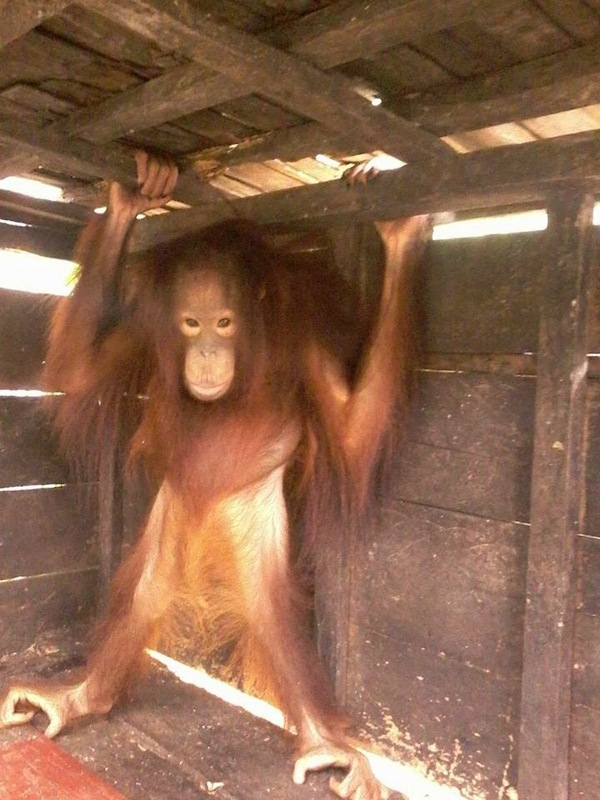 Male orangutan, Joko, rescued in Manis Mata. Photo courtesy of GPOCP. 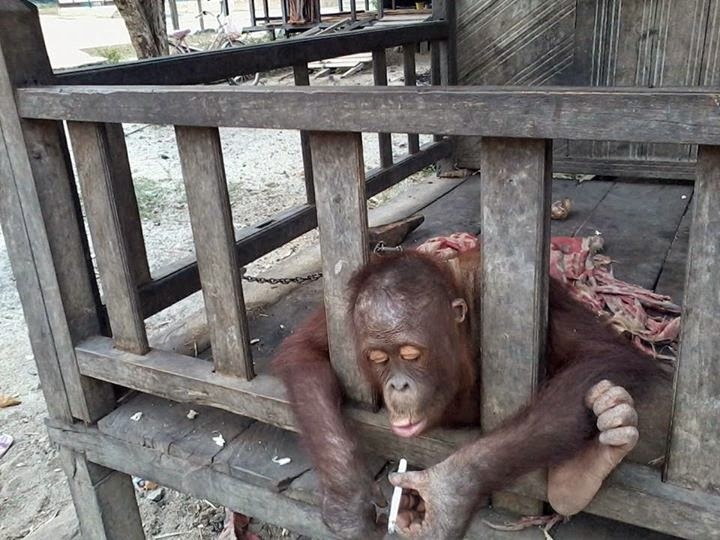 On October 18, after receiving information and photographic proof that the orangutan was still chained up and that he was given cigarettes and arak (a local type of rice wine), GPOCP media staff wrote an expose that was published on Mongabay Indonesia. The link to the article was then sent to the Ketapang Chief of Police, who quickly mobilized officers to go to the scene. 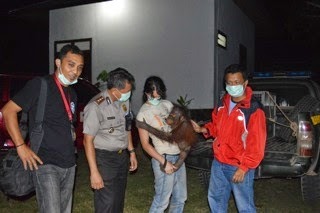 They then seized the orangutan, turned the case over to BKSDA, and brought the orangutan to IAR’s facility. According to the owner, he had initially purchased the orangutan for approximately $83 USD two years ago. 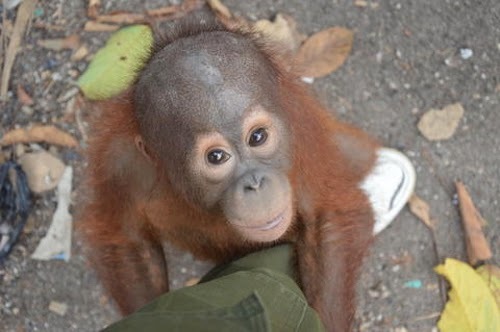 Bob was rescued in early October and is now at IAR's facility in Ketapang. Photo courtesy of GPOCP. Bob’s story is similar. He is approximately a year and a half old, and was purchased for around $81 USD when he was just six months old. Unfortunately this would suggest that his mother was killed as orangutan mothers are very protective and frequently stay with their young for many years. Mr. Agus Setiyoko, the police chief of the Ketapang district, notes that “the communities can help protect endangered animals, not by keeping them as pets in their homes, but by allowing them to live freely in their natural habitats.” Mr. Junaidi, the section head of BKSDA in Ketapang, adds that “We hope the community will help conserve not only orangutans and other endangered animals, but also the forests that serve as critical wildlife habitat.” Orangutans are legally protected under Indonesia’s Conservation Law No. 5 1990, stating that all individuals are prohibited from catching, hunting, killing or owning protected species, including living or dead individuals, or any body parts of these species. Punishment for breaking this law is up to five years in jail and/or 100 million Indonesian rupiah (approximately $8,300 USD). We took advantage of the momentum following other cases to get this female in Air Upas rescued quickly. Photo courtesy of GPOCP. The October rescues represent a concerted and ongoing effort by a team of orangutan conservationists, including GPOCP and IAR staff as well as local authorities, to address the problem of poaching orangutans for pets in this area of West Kalimantan. GPOCP has been working in the Ketapang district since 1999, with additional conservation programs in the district of Kayong Utara to the north, to protect and conserve the Bornean orangutan populations in and around Gunung Palung National Park. The National Park is critical orangutan habitat, with an estimated 5,000 individuals inside the protected area and its buffer zones. GPOCP’s other programs include environmental education, conservation awareness and promoting sustainable, alternative livelihoods to ensure a future for these animals. Woodland Park Zoo has supported the efforts of the Gunung Palung Orangutan Conservation Program since 2003. Every time you visit the zoo, you make this work possible. Thank you. Why is palm oil still being sold?! If not palm oil, some other oil crop would be causing the same problems. Instead of totally avoiding the issue, now we conservation organizations need to start working to minimize deforestation for monoculture plantations such as oil palm- there are hundreds of thousands (if not millions) of hectares of suitable degraded (i.e. not forested) land in Indonesia that could be used if all government agencies, companies and NGOs started working together toward this cause. Hi, I'm from International Animal Rescue in the UK and hoping to get a story in the UK press about the latest orangutan rescues involving IAR and GPOCP. 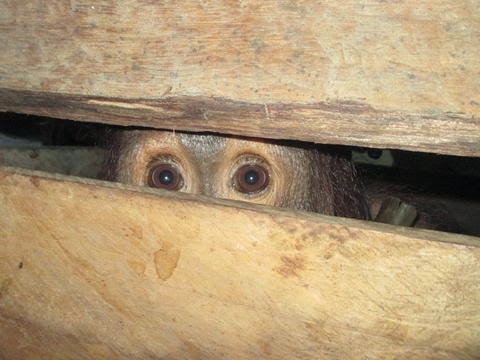 Does GPOCP have any more photos of Joko please before he was rescued? We would of course ensure any images used were appropriately credited. Perhaps some one could let me know? Hello, Lis - Can you shoot me an email at webkeeper@zoo.org with your contact info so I can try to put you in touch with the right folks. Thanks!